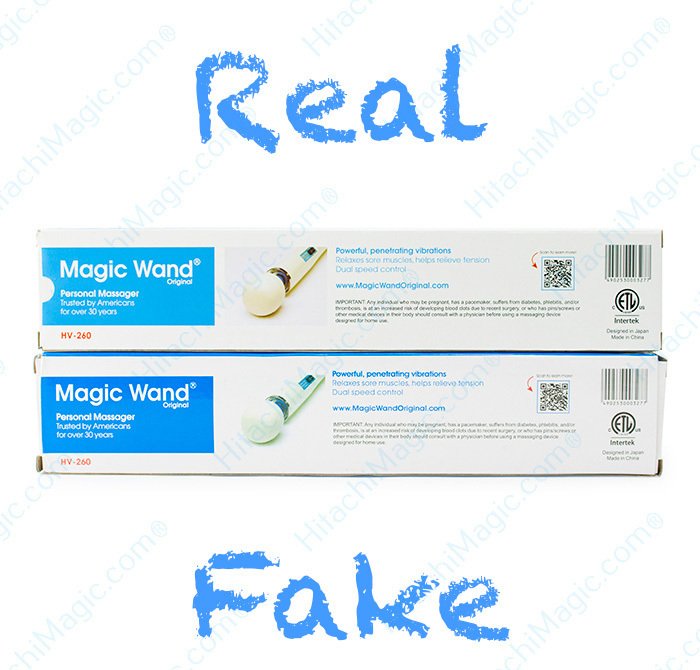 Identifying a Real Hitachi Magic Wand Massager versus a fake Magic Wand is not as easy as you would think. 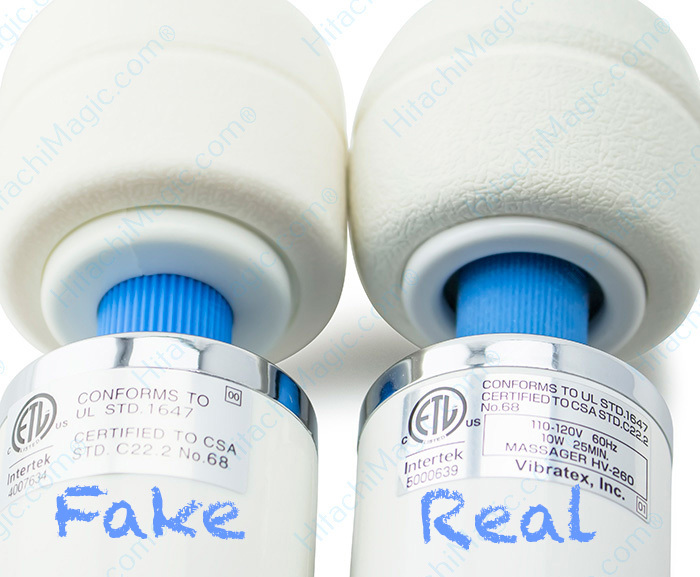 Replica producing manufacturers get visually close to the real Hitachi Magic Wand Massager but the internals and quality of the fake massager cannot compare to the real thing. 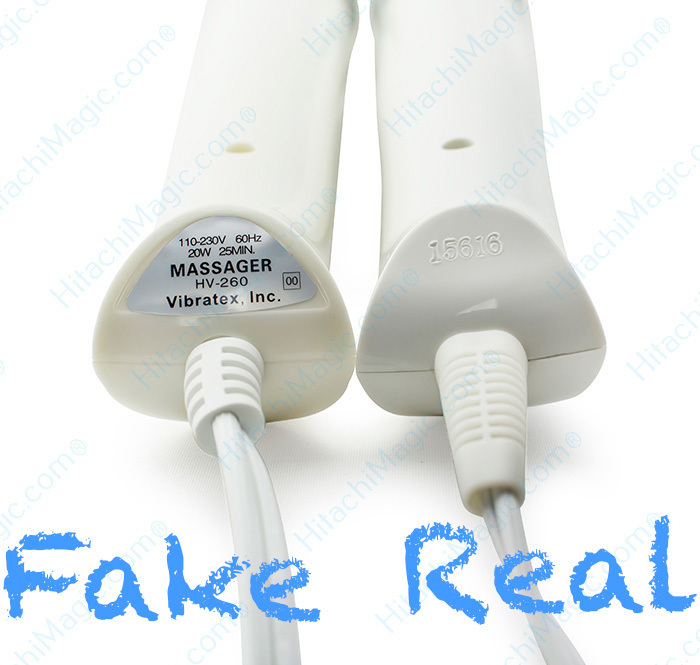 We wrote this guide to assist in how to identify a real vs fake massager so you don’t get fooled by false promises on lower-priced wands. 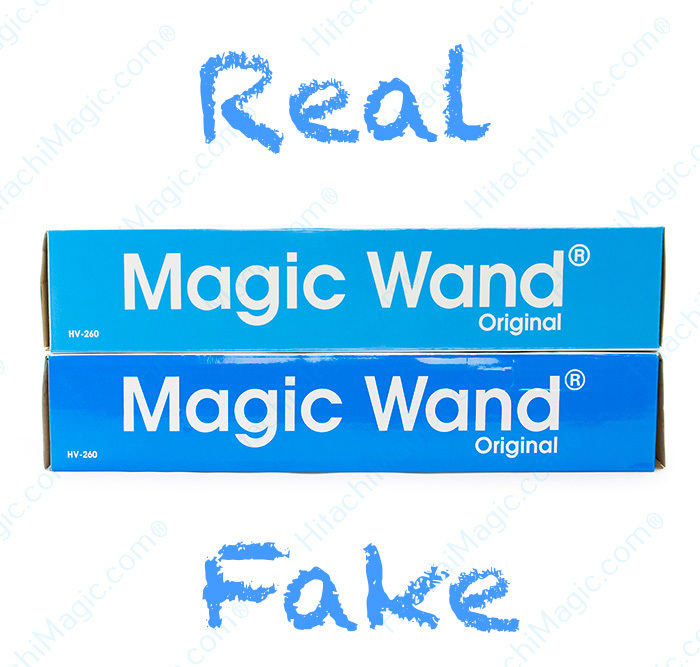 Real Magic Wands have a heavy duty plastic head with black electrical tape surrounding it to secure itself. Some authentic wands have also come in metal in the past as well. 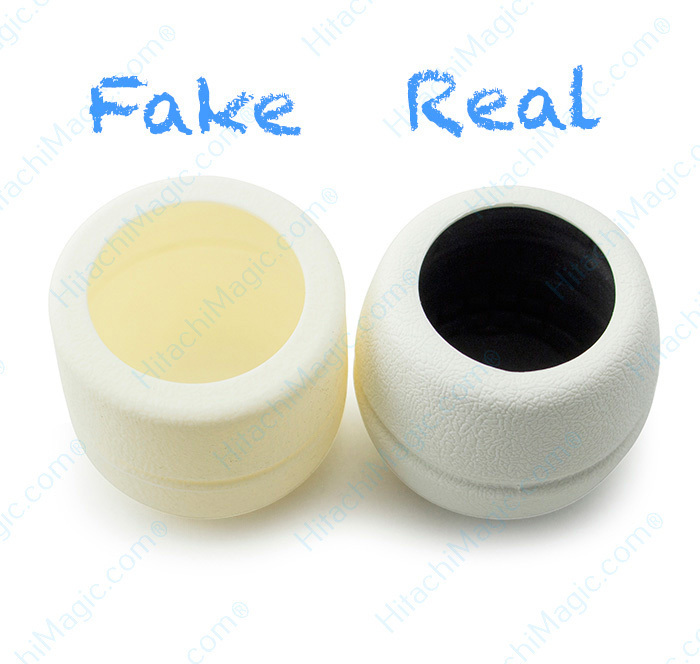 The fake version below comes in a cheaper plastic cover which holds the actual motor inside the head. Notice how the large motor in the real Hitachi is in the body instead of in the head like the fake version? Notice the color difference in the blue box even within the packaging? 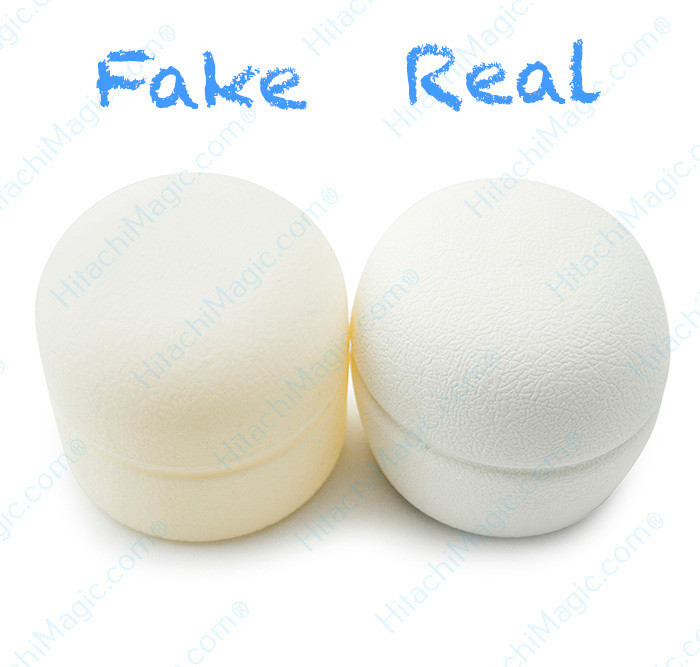 Notice the color difference and quality difference between the real vs fake magic wand head covers? The real Hitachi head cover is very heavy duty and made to last for many years. The fake head cover will most likely tear from a few short months of use. Real Hitachi Massagers have a serial number stamped on every single massager, not a sticker. 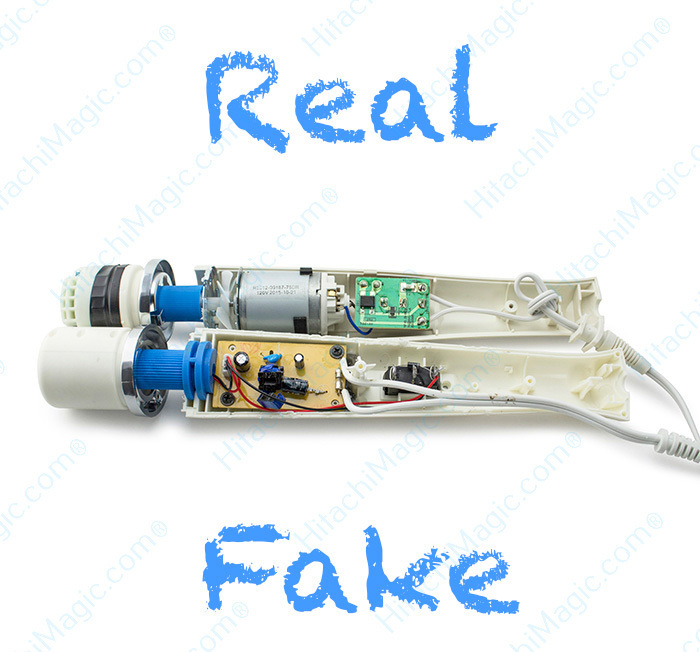 Please keep in mind that this “Real vs Fake” page is for the corded Magic Wand Original, model HV260, only. The cordless Magic Wand Rechargeable, model HV270, is a different massager and cannot be compared to the images shown on this page. Purchasing directly from the most trusted company is essential in getting an authentic Hitachi Magic Wand Massager. We do not recommend you open any massager device to verify authenticity. Doing so will void your warranty as well. Getting a replica might save you a few dollars but your safety and health concerns shouldn’t be compromised for a lower price since replica wands are known to catch on fire, explode and much more. Read our customer reviews to see what customers are saying about our authentic products and let us know if you have any questions. We are always more than happy to assist.